Wouldn’t it be fun if we could go to the thrift store together and figure out what we could make out of other people’s unwanted, used items? I can imagine us now over in aisle 3 in the silver platter section placing silver platters on the floor in different patterns while customers give us funny looks wondering what the heck we are doing 😉 . Not only is thrift store shopping amusing, but it relaxes me, gets my wheels turning, and best of all, if I’m feeling low it helps me feel better. 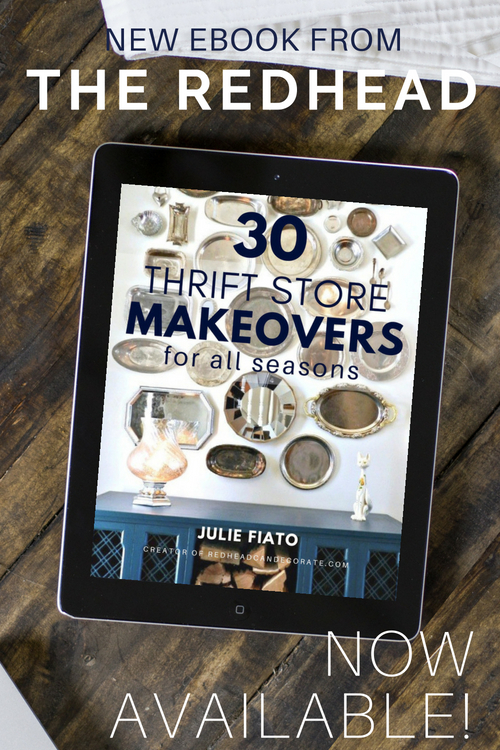 Well, today I hope I can relax you, get your wheels turning, and maybe even brighten your day by presenting my very first e-book 30 Thrift Store Makeovers for All Seasons. 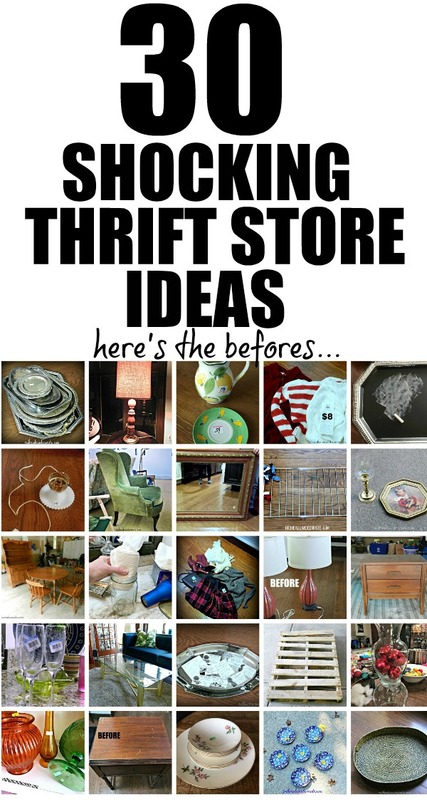 This e-book is packed full of 30 thrift store ideas I have created on my own in our home. I have tested them out! Now it’s your turn to have some fun. Do you want more affordable decorating ideas sent directly to your e-mail inbox? Sign up for my bi-weekly redheadcandecorate.com newsletter HERE. All of us, including my husband, children, and cats thank you for your support. Stay tuned for e-book #2 which will be my very first e-cookbook! If you have questions about your purchase, or if you have any problems with your order, please e-mail Julie (me) at redheadcandecorate@live.com. This is the best thing since sliced cheese good work, love Mom and Dad in NY. I just purchased your Thrift Store Makeover book so I am heading out to the thrift store and find me some goodies, so I can get started. I am pretty excited. Thanks for all the great ideas. I’ll let you know what I make. You just made my day, Bette! Have fun!! I am inspired!! I see some fun projects for many of my thrift store finds. I ordered the book 12/16/18 and paid with my Visa…I have not received my book. Could you check into this for me? I just resent your e-mail with the e-book link in it. Awesome! Since we cannot transfer e-book to others, I plan to visit my sister in another city and pay for the download. My thank you gift for introducing me to your site last year. I love your weekly email blasts. And a big hello to dad & mom in NY. Thank you, Bette! I love your sweet messages. Have a great weekend!! I bought your book a while ago. As soon as we get back from selling his house in Texas the fun begins. He told me I could build the butterfly house. Excuse me? I have tools and I will be building . It wasn’t till I said why buy when it can be made. He said good idea. Ha ha ha.